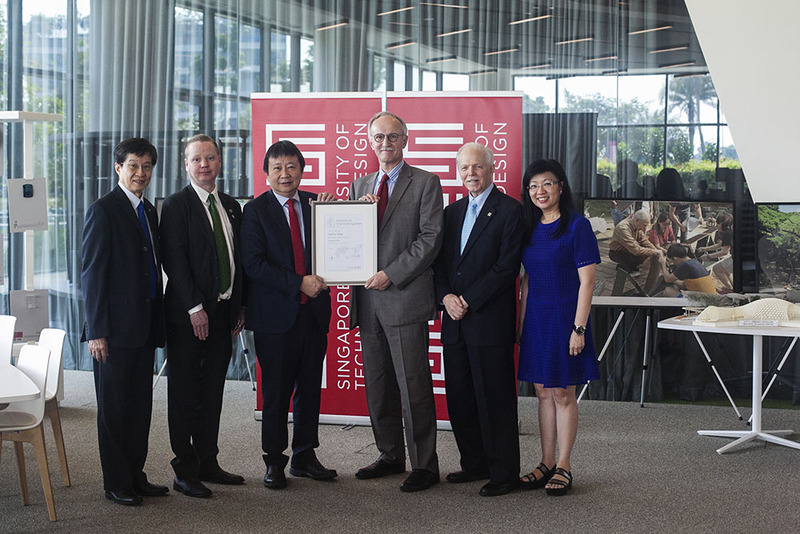 Professor Jonathan Seville, President of IChemE presents the IChemE Honorary Fellowship to Mr Lee Tzu Yang, Chairman of SUTD Board of Trustees. Singapore, 20 October 2016 − Lee Tzu Yang, former Chairman of Shell Singapore, has been awarded an Honorary Fellowship by the Institution of Chemical Engineers (IChemE), in recognition of his commitment to Singapore’s growth in the petroleum and petrochemicals sector. 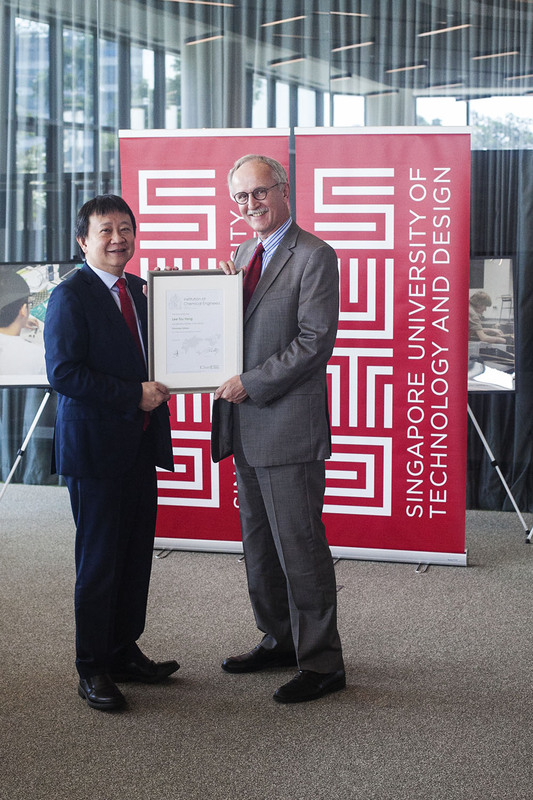 Tzu Yang was presented with the Fellowship today by IChemE President Jonathan Seville, at a ceremony held in the Singapore University of Technology and Design (SUTD) - where he serves as Chair. He is the second Singaporean to receive the recognition. Honorary Fellow status is one of the highest honours awarded by IChemE, and recognises Tzu Yang for his contribution to the petrochemicals industry and his work in process safety. Tzu Yang joined Shell Singapore in 1979, and retired as Chairman towards the end of 2014. He founded the WSHC (Workplace Safety and Health Council) in 2008 and was Chair for eight years. The council has contributed to the drafting of Singapore’s Safety Case Legislation for major hazard instillations. In addition, he is currently Chair of the Board of the Esplanade (Singapore’s national centre for performing arts), the Casino Regulatory Authority of Singapore and the National University of Singapore (NUS) Middle East Institute. SUTD President Professor Thomas Magnanti and Provost Professor Chong Tow Chong also attended the presentation. “All of us at SUTD are delighted that Tzu Yang has received this well-deserved award. And, we are so very pleased that he is bringing to SUTD the leadership skills and creativity that has led to this award. As someone with a Chemical Engineering degree, I am especially pleased that Tzu Yang has received such distinguished recognition from the profession,” said Professor Thomas Magnanti. Tzu Yang is IChemE’s first 2016 Honorary Fellow, and the second Singaporean to receive the recognition. He joins such high profile figures as former BP Chief Executive, Sir John Browne, nuclear industry expert Dame Sue Ion, and fellow Singaporean and former Minister for Education Lee Yock Suan. IChemE Honorary Fellowships are reserved for distinguished individuals from the chemical and process industries that have made significant contributions to their field. Mr Lee is only the second Singaporean to be receive this honour; the last was Mr Lee Yock Suan, then Education Minister of Singapore, in 1974. The online articles below highlighting SUTD chairman, Mr Lee Tzu Yang, who was recently awarded the Honorary Fellowship by the Institution of Chemical Engineers (IChemE).